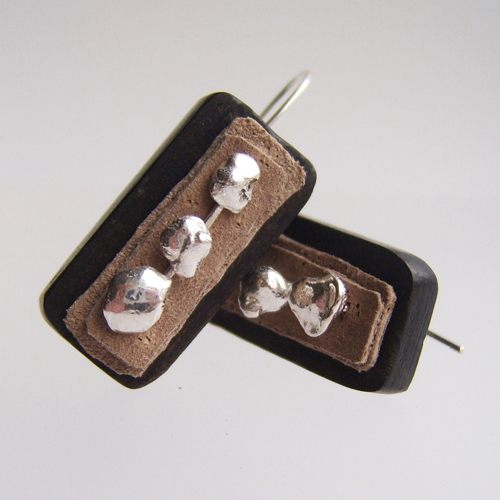 We are James and Bryony Singh, and have been making Contemporary jewellery and art objects together since moving home to Southwest Wales in 2004. From our workshop near Whitland, we use our combined twenty-five years of applied arts experience to create unique, hand made items for galleries, commissions and craft events throughout Pembrokeshire and Carmarthenshire. At Gorsewen Arts our making processes are as environmentally low impact as possible, using a range of materials, from precious metals, steel, and re-claimed acrylics, to re-claimed woods, leather, and eggshell. The materials we use not only help reflect our personal ethos but enhance meaning within an item. The most important element of our practice is that each piece is lovingly crafted from start to finish, to create objects of outstanding quality and individuality. Originally from Pembrokeshire we studied at NEWI in North Wales to gain BA (Hons) in Jewellery and Metalwork, James then went on to do an MA in Contemporary Applied Art and Bryony to do a PGCE in Applied Art. In autumn 2004 we moved back home to Pembrokeshire and began to set up our workshop. We use many types of materials in our work, such as eggshell, reindeer antler, re-claimed exotic woods, anodised aluminium, acrylics, laminated steel, and sterling silver. We try to use materials that reflect the ideas and meanings within the item. An example of this is the use of eggshell, which can reflect ideas of preciousness, fragility, and protection.